My husband and I are driving in the licorice-black depths of night, blurry-eyed and freezing cold in the heart of Kruger National Park. Promises of wildlife cavorting about lures us on, as I wrap the blanket closer around me, half wishing I were back in bed. 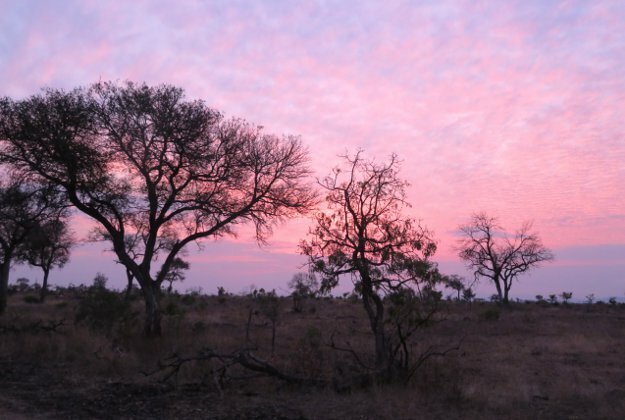 Slowly, the African sky turns bruise-purple, then magenta pink. Scraggly trees create silhouettes against the sunrise, and suddenly the show begins. I no longer wish to be sleeping. 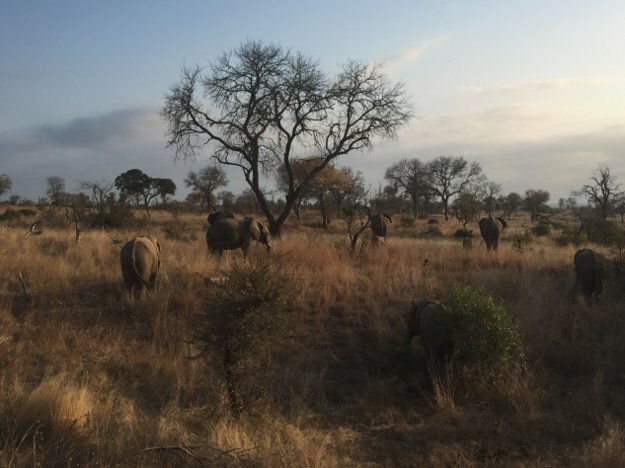 First we spot elephants—a whole herd of them, even babies—lumbering across the road and into the bush. I become snap-happy, disbelieving our good luck. And it’s like that throughout the day, as our guide takes us down one lone, dusty road after another in search of the next animal wonder—giraffes, hippos, rhinos, zebras, and scores and scores of impalas. Though the greatest moment is watching a standoff between two adolescent lions stalking a hyena duo, as they circle our jeep, oblivious to us. Finally, the lions figure they don’t have a chance this time and they stagger off, the hyenas’ heads lifted over the tall golden grasses as they watch the lions retreat, poised should they change their minds. Our guide, who grew up nearby, is a font of knowledge, and he shares tales of the wildlands. The impalas are nicknamed “McDonald’s of the bush,” for their “fast food” role for carnivores; you can identify them by the black “m” on their rear parts. The most dangerous beast is the Cape buffalo, with a wiliness to ambush anyone on its tail. A wildebeest can run after only a few minutes of being born. It’s a whole new world, one in which I’m the intruder, the lucky guest. Since the experience in the Kruger bush, I’ve been on several safaris, including a couple at Mosi-oa-Tunya National Park in Zambia. And no matter how many times an elephant blocks our route with her mass, taking her time to munch a tree branch; no matter how many times I watch a hippo eyeing me warily from the green waters; no matter how many times I think I spot a lion prowling through the tall grasses … I am wowed, downright floored, my heart skipping a beat, at the beauty and majesty of these close encounters of animals going about their daily lives, allowing me to forget the hustle-bustle of urbanity and be thrown into the depths of the universe. As Karen Blixen, author of Out of Africa, once wrote: “There is something about safari life that makes you forget all your sorrows and feel as if you had drunk half a bottle of champagne — bubbling over with heartfelt gratitude for being alive.” No wonder I always yearn for more. Barbara Noe Kennedy worked as an editor at the National Geographic Book Division for more than 20 years. She has written four books, and her writings have also been published in National Geographic, The Daily Telegraph, and the Los Angeles Times, among other publications. She is a contributing writer at Highbrow Magazine. Her husband, David Kennedy, also contributed photographs to this photo essay. 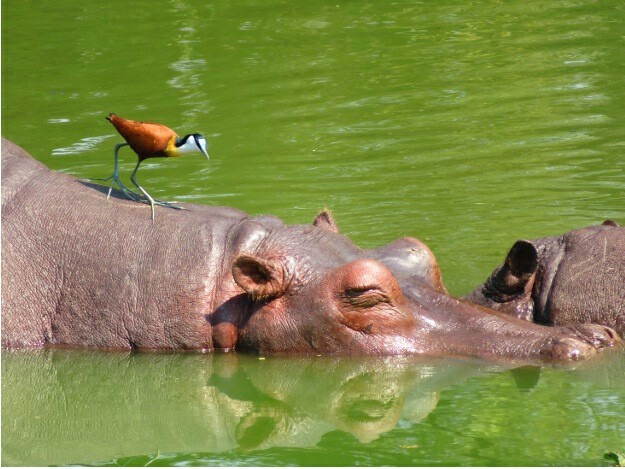 Hippos, believe it or not, have killed more humans in Africa than any other animal. As lazy as they look, they can be aggressive and unpredictable. They can run up to 20 miles an hour—not for very long, but long enough to outrun humans. They can crush you to death with their 8000-pound girth, or use their enormous mouths (up to four feet long) filled with large, sharp canines. The big animals steal the show on safari, but don’t forget the smaller ones as well—many of which can be just as fascinating. 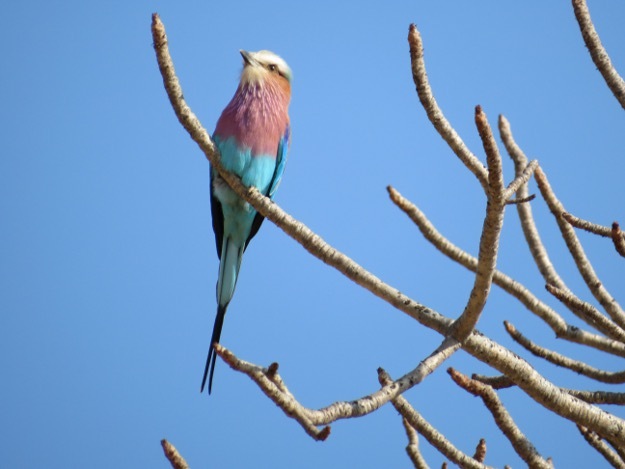 This is a lilac breasted roller, famed for its pastel plumage. Elephants are known to have deep family bonds. In fact, the entire herd—typically a group of females and their offspring—raise the calves together. The males usually leave the herd at age 12 to 15, living solo or with other bachelors. 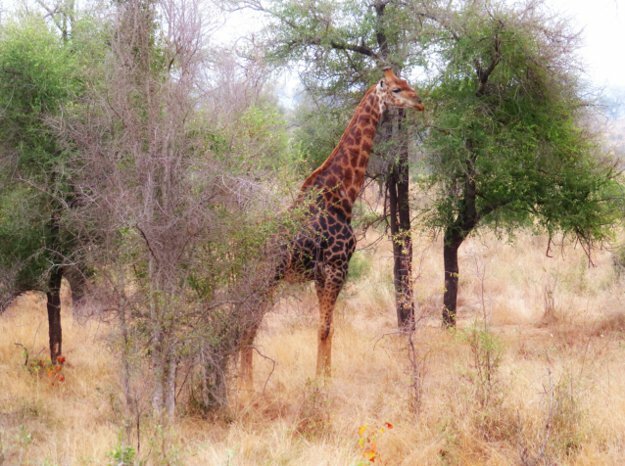 The giraffes, with their long necks, seem to glide through the forest. Surprisingly, they only have seven vertebrae in their necks—the same as humans. The sun breaks over the plains of Kruger National Park. 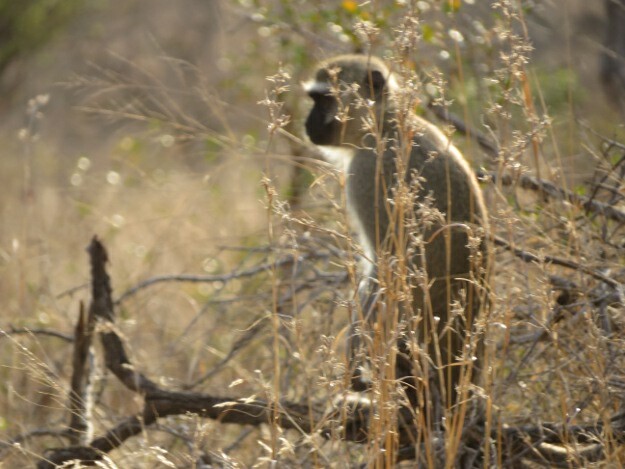 A vervet monkey takes a rare break from its active social life. They live in groups called troops of 40 to 80 individuals and are known for being extremely playful. 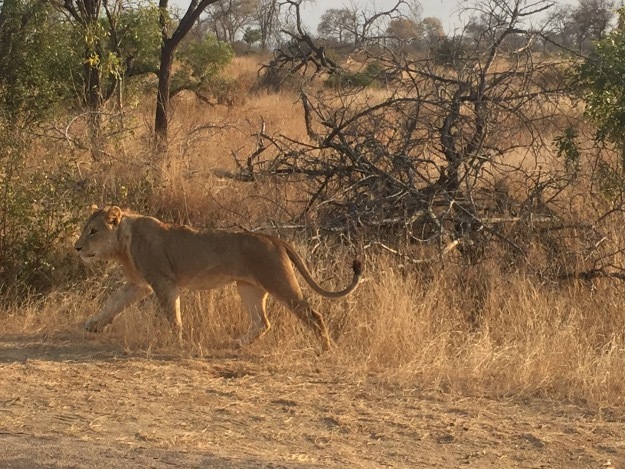 This is one of the lions skulking away from the hyenas. 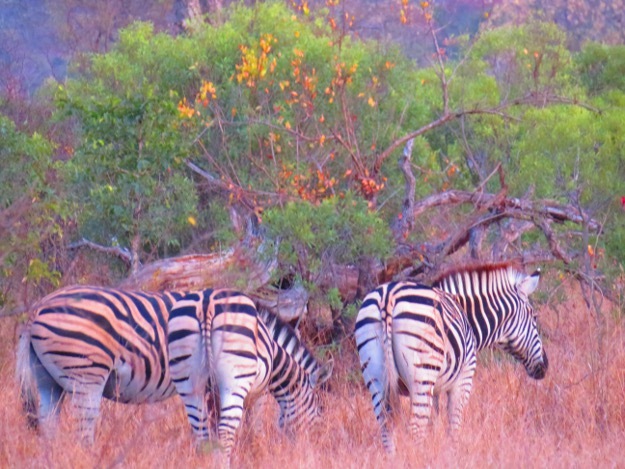 Zebras are black with white stripes (not the other way around, as commonly believed), and the stripe pattern is unique on every single zebra.